Note: The pins are included, Fitbit device is not included. ✔ New Design For Fitbit Alta HR & Alta. Stainless Steel Metal Material. 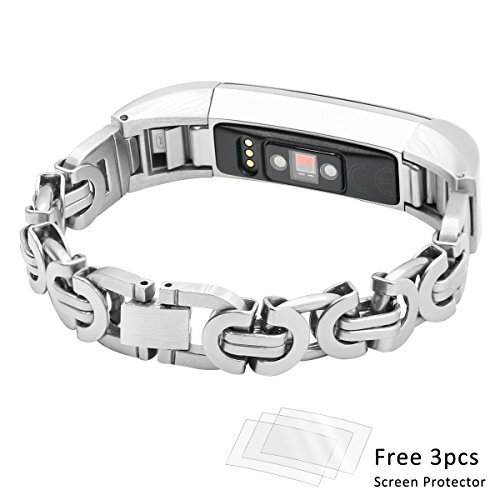 ✔ Package Include 1* Ezzdo Watch Band & 3* TPU High Transparency Screen Protector. ✔ Fit for 6.2"-8.0" wrist. ✔ Unique stylish design, fashion, nobility, durability and elegance, the fashion band design will dress up your Fitbit. ✔ 100% satisfaction and RISK FREE warranty, one year free replacement or full refund.